A bridge that had outlived its usefulness over a village lake outlet was rebuilt by the New York State Department of Transportation both ahead of schedule and under budget last month. The 55-year-old Route 14A Bridge in the Village of Penn Yan, which carries traffic over Keuka Lake Outlet, closed in September 2011 after NYSDOT determined it was too old and needed to be replaced. Since the bridge was being completely rebuilt, NYSDOT took the opportunity to incorporate new features, including energy saving LED lighting and new high visibility crosswalks. Sidewalks were also installed on both sides of the bridge to provide both pedestrian and bicycle access and a water line and storm drainage were also replaced. "This is an excellent example of the department making smart investments incorporating our core principles of asset management and sustainability," said NYSDOT Commissioner Joan McDonald in a statement. The new bridge was opened a week ahead of schedule at a final cost of $3 million, approximately $19,000 under budget. NYSDOT officials, elected officials, and the public joined to celebrate the bridge's reopening on May 23. 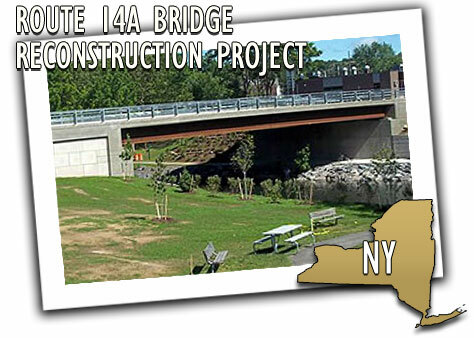 "Penn Yan and the community now have a better, stronger, superior bridge that is better lit and more pedestrian friendly than the structure that used to be there," said NYSDOT Acting Regional Director Brian Kelly. "We want to thank motorists, residents, local officials, and business leaders for their patience while this important project was underway."